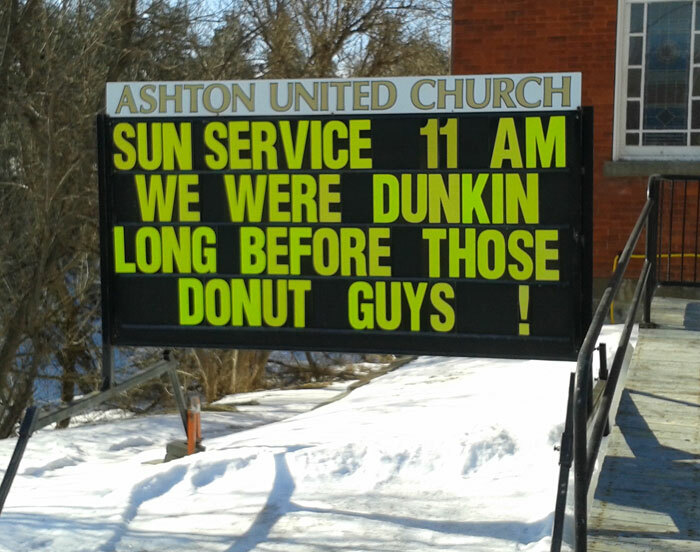 I expect many readers are not aware of the sign board in front of Ashton United Church. 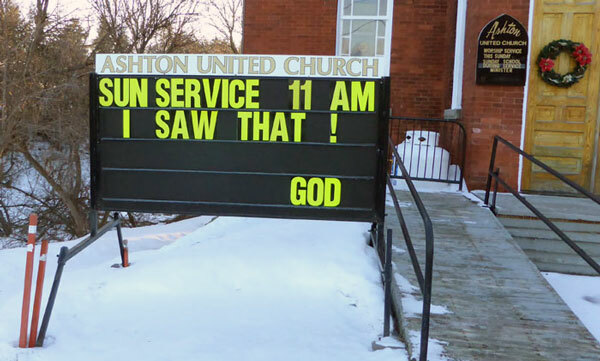 They deliver a weekly message for everyone to consider. Some are outright humourous. Others inspire. Others create some thought – whether serious about the message or about some funny saying. These messages have been appearing for a long time now and I wonder how many people have seen and read them. 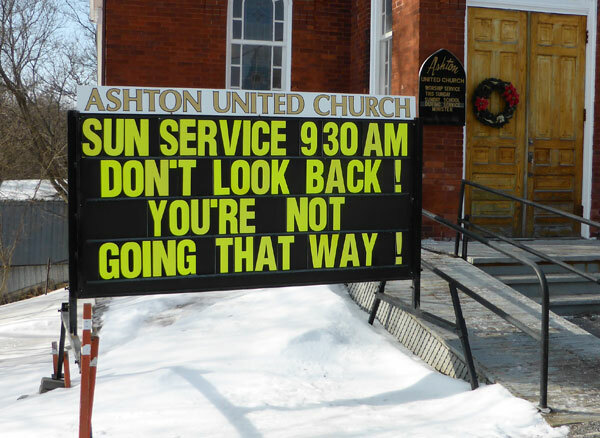 There seems to be a moderate amount of vehicle traffic passing the crossroads each time I am in Ashton, so I expect many pairs of eyeballs are being attracted to the message each week. Congratulations goes out to the person who researches messages and posts them weekly. I know who it is but I don’t know whether or not he wishes his name to appear here. There is a purpose to each message. 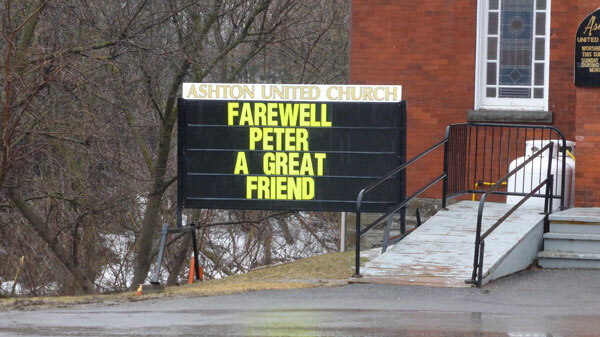 It can range from advertising an upcoming fundraiser, such as ‘Music in the Village’, a supper, or the UCW Bazaar and tea, to a special service to service times to recognizing an individual to a humourous saying. I do not wish to present all of them as I don’t have photos of each of them. A few I have photographed because I enjoyed them very much and knew I would never remember the message or saying. Also, if I could present them all I would create a page about 100 meters long and readers would be scrolling down for a long time. I have selected a few for which I could find images quickly and to give a representation of what people see passing by or when entering for a church worship service or meeting. Also, I don’t want to present all of them because it would mean people wouldn’t drive by and experience the sight of them first hand. 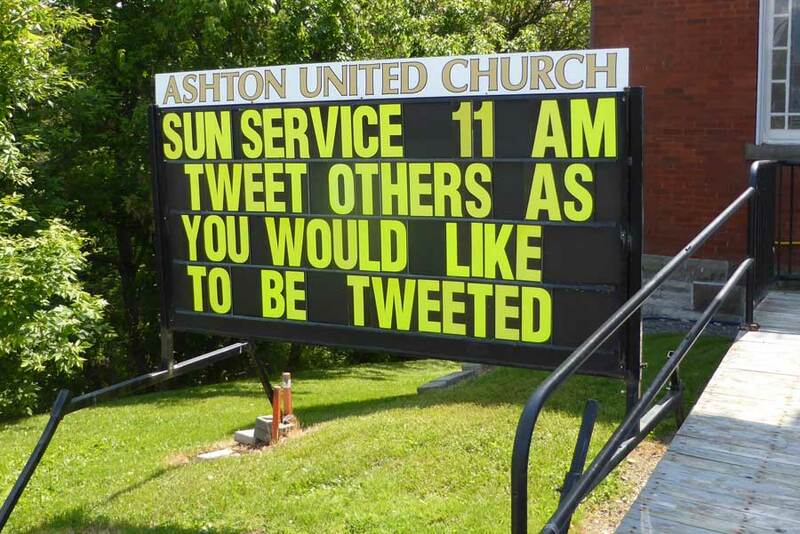 An example of service time inforamtion is the following summer sign. And recognition of a fine gentleman, member of the congregation, great friend to many, helper at Ashton Church, and faithful servant of God who passed away in early 2017. Here’s a seasonal message leading up to Thanksgiving from october 2017. I believe there is a double meaning here but we’re not trying to identify anyone if that is the case. 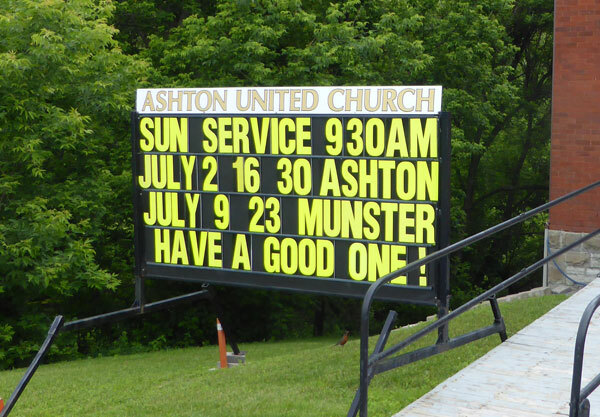 Ashton United Church front sign with good advice – or was that a warning? It depends on you. I will add more to this page occasionally for your enjoyment and to encourage anyone in the area not driving by the message board to drive by and experience the message first hand.